This book did not disappoint! I will be canning almost every recipe she supplies in the book. They look delicious. Some of the canning recipes are a little out of the box with recipes that can be canned any time of the year as well as recipes for main dish meals and soups in a jar. She also has canning recipes for condiments, leftovers, and canning your own recipes. She also takes a lot of time to focus on traditional canning, how to can, and canning safely. She is an experienced canner so she knows how to can correctly and safely. That is something I can definitely appreciate! What I like most about this book (besides the recipes!)? 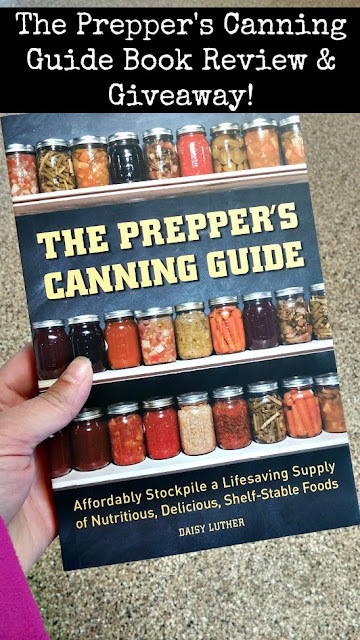 I love that this is canning book geared towards preppers. She gives valuable advice about how to can in a grid down situation. She lets you know what works and what doesn't work. As a prepper, while I like to figure some things out for myself, I don't have time to figure it all out. Daisy cuts through the guessing process and lets you know that it may be harder than you think to can over a wood fire!